As you look for cheap ATC Honda three wheeler parts, you might be missing out on an opportunity to save a ton of money on what you need. There are only a few ways to get your hands on parts for repair for your old Big Red, 250r, 110cc 3 wheeler, or other all-terrain cycle. In this article, I’d like to share the best ways to get them, even if you want to go cheap, and share a legitimate alternative you might not have ever considered. Call around to the Honda dealers in your area and you can order aftermarket parts for three wheelers. You’ll pay a little more, but you’ll get a quality component and have someone to talk to in person, a place to take it back, and a way to avoid shipping and handling charges on your purchase. There’s almost nothing that can compare to buying an old non-running three wheeler and cannibalizing it for repairs. If you own a 250r, for example, you’d search to find a non-running or beat up 250r for sale cheap. 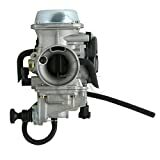 This will allow you to take the carburetor, hoses, recoil, rims, and other components off it whenever you need them. Since you can often buy one that’s not running for a couple hundred dollars or less, you’ll save a lot of money if you just use a few items off it. eBay, Amazon, and even Craigslist will offer you a great way to save a ton of money on both new and used parts. In addition, there are several sites dedicated to motorsports, like Honda Parts House, that will likely carry anything and everything you could ever need for repairs. If you own a 110cc Honda ATC, this is a great option. Honda’s patents expired over a decade ago, which opened the doors for the Chinese quad market to copy their engines. This means you can buy an entire motor for just over 100 dollars online, saving you a ton of money. You can buy individual items as well, so you’ll save no matter what you need to get up and running again. There are multiple manufacturers and some are truly interchangeable, so you can save a ton of money. As you can see, you have some options as you are looking for Honda ATC 3 wheeler parts for sale.